Are you SICK of feelings STRESSED, TIRED, or OVERWHELMED? Or do you simply what to FEEL BETTER? AT EASE . . . PEACE . . . CONNECTED. RECONNECT with NATURE. RECONNECT with YOURSELF. RECONNECT with LIFE. Advanced registration required: Call 443-397-9733 or email jess@hagyrestorativeyoga.com to register. Dress comfortably and be prepared to learn in a relaxed, supportive environment. This retreat will incorporate introductory Ayurveda education, open discussion, breathing techniques, yoga and meditation. No prior experience or knowledge necessary. Handouts will be provided, but you are welcome to bring a journal. Mats, blankets, bolsters, and chairs will also be provided for your comfort. Join us as we honor the transition from winter to spring with a restorative retreat intended to enhance relaxation and cultivate optimal conditions for health and wellness. Restorative Yoga involves resting in supportive postures designed to engage the parasympathetic nervous system (rest & digest response) and release tensions held in the body. Restorative yoga offers an opportunity for unity of the body and breath in the present moment and respite from external stimuli. iRest® Yoga Nidra is a process of meditative self-inquiry derived from the ancient teachings of yoga. When practiced regularly - a little and often - iRest enables us to meet each moment of life with unshakable peace and wellbeing, no matter how challenging or difficult our situations. 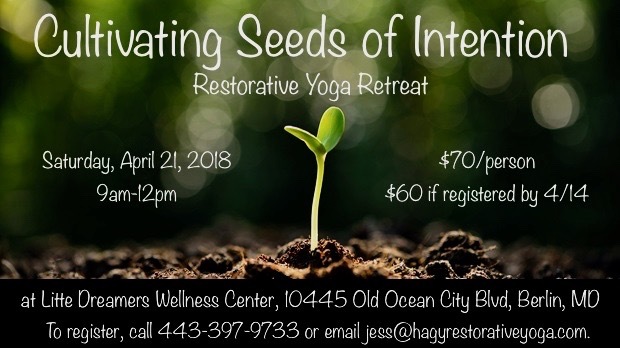 Advanced registration required via 443-397-9733 or jess@hagyrestorativeyoga.com. Dress in comfortable clothing. All props will be provided. Self care is much more than the actions we take to care for ourselves. It is a way of being, an art. Join us in exploring a variety of approaches to self care, and leave with a personalized plan to enhance your own wellbeing. Activities will include restorative yoga and yoga nidra meditation to relax the body and calm the mind. Dress in comfy clothes. Mats and props are provided. Whether or not you were able to attend The Four Agreements series, you are welcome to join us in discussing how to apply the agreements in our daily lives. The Four Agreements—Be Impeccable With Your Word, Don’t Take Anything Personally, Don’t Make Assumptions and Always Do Your Best—offer a path to freedom from the beliefs that no longer serve us. We will also practice yoga and meditation techniques that support the process of letting go of old agreements and embracing new ones. Dress in comfy clothes. Mats and props are provided. Relax, Renew, and Restore . . . with Integrative Restoration (iRest®) Yoga Nidra at Zenna Wellness in Berlin, MD. Plan to dress comfortably, in layers, (bring socks if your feet tend to get cold) and prepare to rest in a lying down position, supported with yoga mats and blankets, as you are guided through this deep relaxation, meditation practice. Some yoga mats and blankets will be provided, but feel free to bring your own mat, pillows, eye pillow, or blankets to enhance your personal comfort and support. The Berlin Meditation Group meets every Monday at 7pm at the Zenna Wellness Studio, 10 S Main Street, Berlin, MD. Donations are appreciated. Announcement: Class will be cancelled on October 10th. I’m going to see the autumn foliage and breathe in some fresh, mountain air! Classes will resume the following week. Thank you for your understanding. 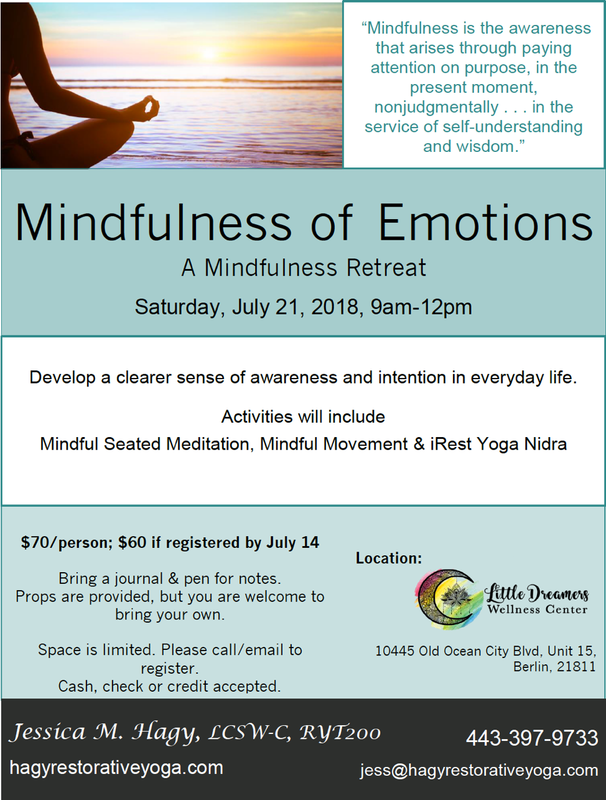 Whether you are new to mindfulness or continuing a lifelong practice, this retreat is designed to meet you at the level of your needs. Mindfulness opens up new ways of being with ourselves and one another that offer a deeper sense of purpose and quality of life. We will start with the body because we experience everything through the body; in the upcoming months, we will take a mindfulness approach to exploring emotions and thoughts. If you have any questions about mindfulness or the retreat activities, please feel free to call or email. Dress comfortably, in layers, (bring socks if your feet tend to get cold) and prepare to rest in a seated or lying down position, supported with yoga props and blankets, as you are guided through calm breathing exercises, gentle movements to release tension in the body, and a deeply relaxing meditation practice. Yoga mats, blankets and other props will be provided, but feel free to bring your own mat, pillows, eye pillow, or blankets to enhance your personal comfort and support. Announcement: New Location & Time Starts March 21st at Little Dreamers Wellness Center. See 3/21 Event for more info. Learn to cultivate the foundations of mindfulness in everyday life during this Mindful Living Mini-Retreat. Dress comfortably for seated meditations, mindful movement, and lying-down body scan. Mats and blankets will be provided. Feel free to bring your own additional props. Living a Playful Life - As adults, many of our clients (including us) have lost our connection with the importance of play. This “playshop” will address the benefits of play in overall wellness, engage participants in playful activities, and encourage playfulness in everyday life. You will learn the positive impact this can have on progress with clients. iRest Yoga Nidra for Compassion Fatigue - What makes us vulnerable to compassion fatigue, and what can we do to protect ourselves while still opening our hearts and minds to our clients and patients? Learn about and experience relaxing, restorative benefits of iRest and how the practice can help address and protect from the effects of compassion fatigue. Enhancing Your Life Balance - We all have the power to enhance our own wellness. It doesn’t require much effort, and believe it or not, it can be fun!! Having the ability to impart this knowledge on our clients is an amazing gift. Participants will learn to take a holistic approach to wellness and will create a personalized plan to enhance their own life balance. This experiential workshop will allow you to gain the knowledge you need to put these techniques into practice with your own clients. Sunset Yoga on the Beach - Join us for a relaxing and refreshing way to end your Saturday. 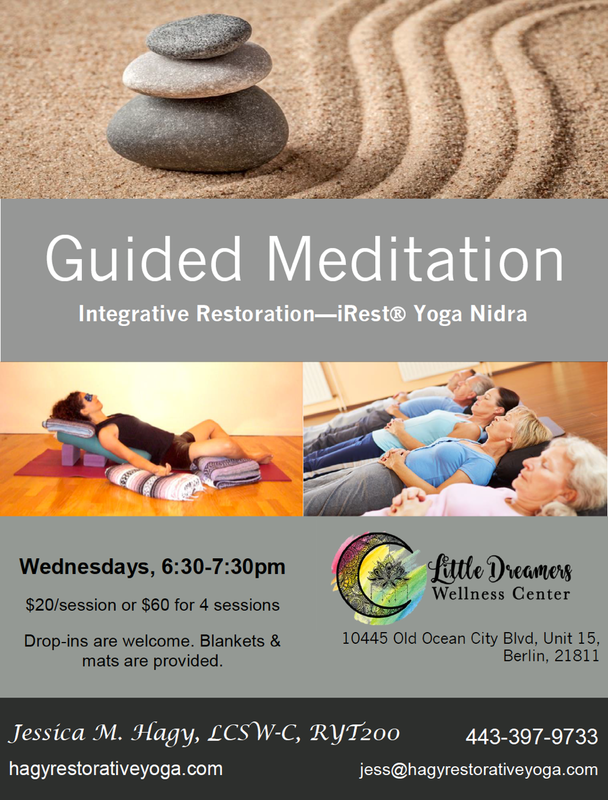 Relax and unwind at the end of the day with Integrative Restoration (iRest) Yoga Nidra, a deeply restorative, guided meditation practice that helps to calm the nervous system and ease the mind. Bring a yoga mat, towel, blankets, pillows, socks, extra layers, . . . whatever you might need to be warm and comfortable. 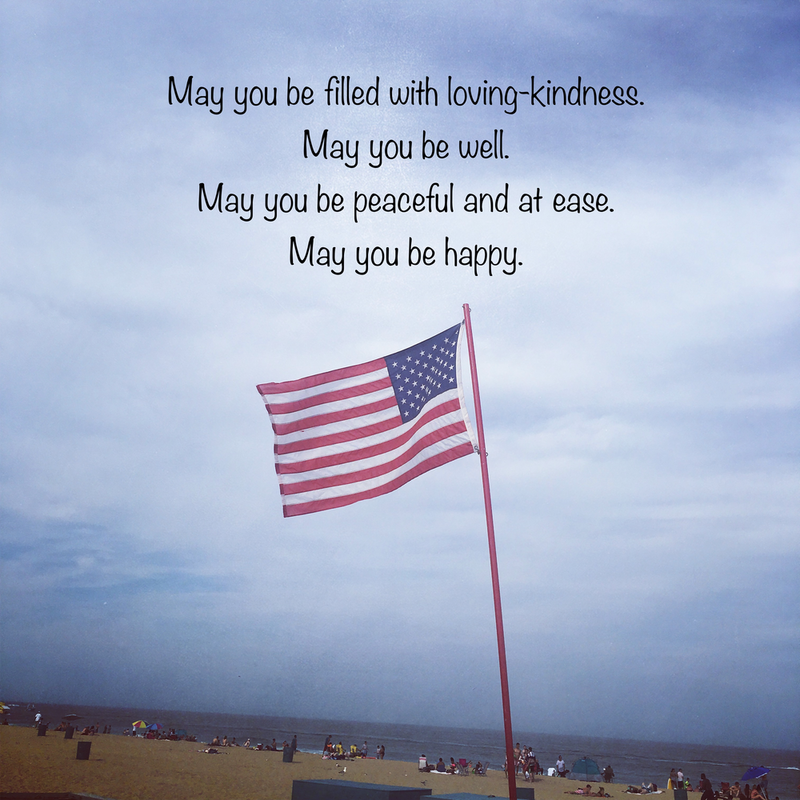 The Berlin Meditation Group meets every Monday at 7pm at the Zenna Wellness Studio in Berlin, MD. Donations welcome. Visit www.zennawellnessyoga.com for more information. 1st Monday "Intro to meditation"
2nd Monday "Acupuncture and Meditation"
1/4 "Intro to meditation"~exploring what works best for your body in the traditional seated pose and how to use props. 1/11 "Acupuncture and Meditation"~ welcoming back Mark Stoer for a combo of shoulders and above acu points and meditation! 1/18 Yoga Nidra led by Jessica Hagy~ "yogic sleep"
1/25 Singing Bowlsled by Robert, Jan and Liz...amazing experience!